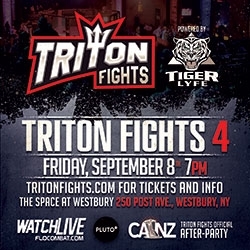 Westbury, NY, July 27, 2017 –(PR.com)– Triton Fights today announced the featured fights for Triton Fights 4 powered by Tiger Lyfe, happening September 8th at The Space at Westbury. The main event will feature the vacant 135 lb. women’s title fight between the undefeated Diana Karavas and Pittsburgh’s Elizabeth Lewis (5-1). The co-main events will also be for vacant titles as Danny Maldonado (2-2) faces off against Geo Alvarez (7-7-1) and undefeated Austin Wolfson (5-0) goes up against Renzo Gracie Academy’s Chris Kevlin (2-2) in what is sure to be a great fight. The stacked night of fights will also feature the much anticipated MMA debut of grappling sensation Amanda Leve. Amanda, fighting out of Ricardo Almeida BJJ, has made a name for herself in the BJJ circuit as she was featured on one of the most watched BJJ YouTube video for tapping out a male opponent. She has been named the “Next Big Thing in MMA” by the Jiu-Jitsu Times. It all goes down Friday, September 8th at the Space at Westbury, 250 Post Ave., Westbury, NY 11590. There will be 12 MMA fights in all with doors opening at 7pm and the first fight starting at 8pm. Tickets start at just $50 and can be purchased at TritonFights.com. The fights will also be streamed live on FloCombat.com with replays starting the following week on the free Pluto TV app. The event is sponsored by Tiger Lyfe, Strikeforce Sports of Deer Park and Canz Sports Bar of Westbury, the official after-party of Triton Fights.